Owing to concerted efforts by civil society organisations, awareness about air pollution in India and its resultant impact on human health has increased in the past decade. Timely judicial interventions forced state and central pollution control boards to broaden their purview to accommodate air pollutants. For a long time, these bodies restricted their monitoring activities to only visible forms of waste -- found on land or in water bodies. Today, many cities in the country -- big and small -- have set up stations to regularly measure pollutants such as carbon monoxide, oxides of nitrogen and carcinogenic hydrocarbons, belched out by power plants, chemical industries and an ever swelling automobile fleet. Tackling air-borne pollutants at their source is a good idea, but an impossible practice. Talking of urban air pollution models, B Padmanabha Murthy says: "Air quality monitoring stations usually collect data as per the established norms of Pollution Control Boards. This is inadequate. Networking of monitoring stations should be on a scientific basis and recording equipment must be set up to obtain precise hourly ground-level concentration." A host of meteorological conditions -- speed and direction of winds, atmospheric temperature, humidity, and precipitation -- make mischief, making it difficult to trap the noxious fumes. In Environmental Meteorology, Murthy deals with this interplay of meteorological factors and pollutants. According to him, this has spawned environmental concerns such as climate change, ozone depletion, global warming and acid rain. The book delves deep into the science of various meteorological parameters that are influenced by urban changes. A typical example is the 'heat island effect' in urban areas. Space cooling in summer, heating in winter, industrial and transport activities as well as household energy consumption lead to formation warm pockets within a city. This anthropogenic heat combines with summer heat, enhancing the thermal humidity index and making the environment unbearable. In winter, this might cause enhanced heat island effect. Murthy attempts to explain the process in detail through isotherm and isohume maps of Delhi, Mumbai, Kolkata and Pune. 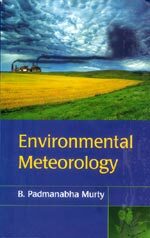 Environmental meteorology is a fairly new subject and there is no comprehensive textbook for students in this interdisciplinary area. So, Murthy's book is a welcome arrival. The author has taught the subject at the Jawaharlal Nehru University, New Delhi, for nearly two decades. However, the 'textbook' tag need not desist other readers from having a go at it. The book makes for a good and informative read even as it explains, quite simply, various meteorological processes and the tools employed used for measuring them. Besides, Murthy's own involvement in air pollution model studies and his experience in conducting environmental impact assessments enriches the text.